Kabang you’re the number 1. She beats some other heroic animals like Gorilla Benti Jua, Katrina the Dog, Mila the whale, A pod of dolphin, Roselle the dog, A Cat name Tara,Belle also a dog, Unshkin a cat, and the last Toby a dog. Tody is a dog that help its master when Debbie Pakhurst from Calvert is eating an apple apparently when she was eating in the front of Tody, somewhat happen that while she was eating suddenly she got choke with a piece of an apple. She tries bang her chest but unfortunately she failed to help herself. But Tody is a brave dog that love its master, when Tody felt that her master was in very critical condition and saw its master falling on the ground Tody began to jump up on the masters chest again and again until such time a piece of an apple dislodge. Choyce a disabled owner of Unshkins a cat,He was working on its laptop outside the house a two men driving with a car stop and attempt to get his laptop while the other one is keep on ponching him. Unshkins saw that the master was in danger he begun to fight with the snatcher, a cat scratch their face and giving a chance Choyce to punch a snatcher larynx. This was happened last 2007. Last 2006, a dog named belle catch the people in Florida. Bell is a trained dog to rescue its master if there is something wrong. At that time, Weaver is Bell master is suffering diabetes and is prone to seizures. One day Weaver blood sugar dropped dangerously. Bell automatically dials 911 asking for an emergency help. From a CCTV caught how Tara helped the little. A little boy named Jeremy Triantafilo was playing outside when suddenly a neighbour’s dog run up and bite him on the legs drag him to the ground. Tara with a heroic mind, begun to run after the dog chasing it and trying to stop the dog, until the dog loosen the grip from the little boy leg. The said video begun to spread on youtube. Remember the 7th 11 attack? Don’t you know that there was a dog named Roselle done such heroic act because of saving its master and several people in twin tower? Michael Hingson is a blind since birth he was trapped together with other business man around. While everyone panicked, Michael was kept calm by his guide dog Roselle, by leading him down stairs of the collapsing building till they came out together with some other people following them. Have you ever remembered a story from the bible that a big fish save a man, it is almost like in this story, when a fisherman goes to the sea of Puerto Princessa City Philippines for fishing. While he was in the oceans unfortunately the ship begun to sink. A man is named Ronnie Dabal, was trying to save his self by holding such a Styrofoam board. After several hours while he is floating in the middle of the sea he begun to lose consciousness and begun to close his eyes. On that time a pod of dolphin encircle him and guide to shore, Dabal think that his just hallucinating but he prove that it is true because he was never totally out of concios. Story that very heart whelming, Yang Yun was applying to be a Polar Land Aquarium Harbin last 2009 in China. When she was swimming after a several minutes, she felt a crumps on her leg, and begun to sink. Mila the dolphin felt that Yang needs help. Suddenly Mila gripped her legs and bring her to the shore. It was 2005 when an during a disaster of hurricane, a man was rescued by the dog telling that at the time when a water is rising the dog came and pulled him to the higher place. After the man story heard, and spread to the news, a team returned to the place and successfully rescued Katrina. At Brooklyn Zoo Last 1996, while a three years old child away from his mother, he climbed over the Gorillas barrier and fell for almost 30ft into the ape pit, and knocking his self unconscious, Gorilla Binti Jua picked up the child and gently bring it to the zoo keepers. 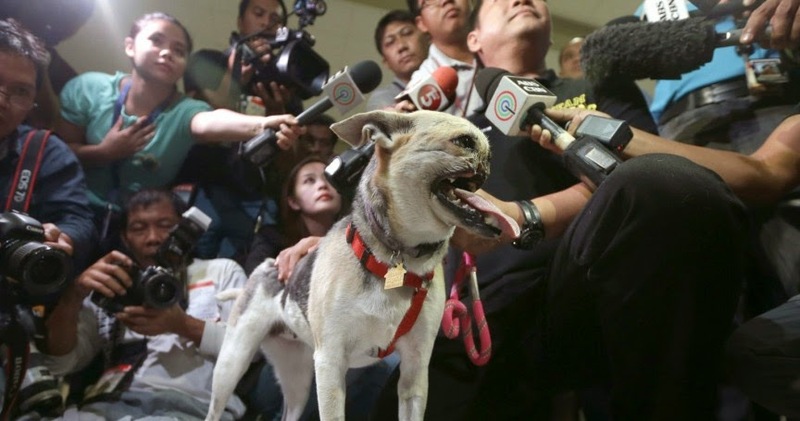 And the most awaited is the Dog came from Philippines, a dog that sacrifices its life just to bring safety. Kabang was sniffed off its nose when saving its master on an incoming accident.